TIP: Use your browser’s “Find” option to search of ad subjects and keywords quickly. Richard O’Connell at (856) 548-1030 ext. 445, or e-mail rconnell@slackinc.com. FL is leading practice in Lakeland and seeks energetic partner for constantly growing community of more than 500,000. Suburban environment provides a varied patient mix and perfect reimbursement. NOTE: NO STATE INCOME TAX! Orthopedic Surgeon Opportunity NORTH-CENTRAL FLORIDA – Munroe Regional Medical Center, a 421-bed facility in Ocala, FL, is searching for an orthopaedic surgeon with a minimum of 5 years of practice experience to practice in a nearby active retirement community. Wide variety of cases to include sports medicine and joints. Fellowship training in minimally invasive surgery is preferred but not required. 4-days of ED call/month. 1 in 3 call. $400,000 salary, productivity incentive, malpractice insurance and comprehensive benefits. Contact Nancy Agee at 800-678-9788 x64855; nagee@cejaksearch.com; or visit www.cejkasearch.com. ID#136086OY. National Orthopedics: B/Q B/C Orthopedic Surgeon Growing high quality and well-respected orthopedic practice in Palm Beach County, Florida is seeking B/Q B/C orthopedic surgeon. Successful candidate will be a team player, have strong patient communications, with strong surgical and clinical skills. Practice has a large referral base with call at local hospitals. Practice is looking for general orthopedist as well as sub-specialties. Attractive financial package includes guaranteed salary, incentive plan, full benefits, paid vacation and CME allowance. Partnership opportunity available to qualified individual. We invite you to explore this opportunity. Send CV via facsimile 561-422-5983 or via email to mimisko@wcfoot.com. WESTERN INDIANA – Orthopaedic Sports Surgeon Orthopaedic Sports Surgeon sought for 83 physician group in a University community in Western Indiana. Fellowship training in sports with emphasis on knee surgery preferred. 1 in 6 paid call. Brand new 348 private room hospital. Surgeon owned ASC. College and high school team sports coverage. 80,000 population community that is regional hub for excellent dining, historic and cultural attractions, outdoor recreational activities and a variety of shopping options. $450,000 – $500,000 salary, $65,000 signing bonus, $2,500/month fellowship stipend, $120,000 student loan payments and comprehensive benefits. Contact Todd Dillon at 800-853-7655 or tфdillon@cejkasearch.com; www.cejkasearch.com. ID#138368OY. ORTHOPEDIC SURGEON OCHSNER HEALTH SYSTEM in BATON ROUGE is looking for for a BC/BE Orthopedist to join its practice. Fellowship training is welcomed though not required. Please send your questions to: ochsnerphysiciancv@gmail.com, Ref #AOBR02, or call 800-898-2240 for info. Sorry, there is no J-1 visa opportunities available. CHAIR DEPARTMENT OF ORTHOPEDICS OCHSNER HEALTH SYSTEM is searching for a SYSTEM CHAIR OF OUR MULTI-SITE DEPARTMENT OF ORTHOPEDICS. The candidate will be board-certified, subspecialty experienced, a qualified surgeon, possess leadership properties, team building, managerial experience and have a successful academic background. Salary offered will be high enough and corresponding to experience and training. The department has 24 orthopedic surgeons of all orthopedic specialties and subspecialties. Ochsner’s independent residency program has recently been re-accredited for five years by the ACGME. The residency is administered by a program director and has 10 to 13 residents, with OITE scores above the 85th percentile. Our Department of Orthopedics has been recently listed as #34 in the U.S. News & World Report’s 2010 publication of the “Best Hospitals in America.” Besides, Ochsner is incuded in the top 50 hospitals in seven other categories. Ochsner Health System is a multi-specialty healthcare system devoted to patient care, research, and training. Our goal is to serve, heal, train and innovate. The system includes 8 hospitals and 39 health centers throughout Southeast Louisiana. Ochsner has more than 800 physicians of all medical specialties and subspecialties. We conduct more than 400 clinical research trials every year. To learn more details, visit our website at www.ochsner.org. Ochsner Health System and The University of Queensland Medical School in Australia started a partnership in 2009 by opening School of Medicine at the University of Queensland, Clinical School at Ochsner, providing medical students with an inestimate training experience. The candidate for Chair of the Orthopedics Department will be able to get an academic professorship appointment from the Queensland University. New Orleans is a huge historic city with amazing architecture, numerous medical schools and academic centers, professional sports teams, cultural interests, and famous live entertainment and music. Interested physicians should send curriculum vitae and vision statement for review to Adam S. Bardot, M.D., Associate Medical Director, Surgical Specialties. Email: ochsnerphysician@gmail.com, Ref. #AROCH01. Information: (800) 488-2240. EOE. Cambridge Health Alliance Cambridge Health Alliance (CHA) is a Harvard Medical School teaching affiliate and an award winning, which received national recognition for innovation and community excellence. We have three campuses in our care system; Cambridge, Somerville and Everett, as well as over 20 other successful primary and specialty practices in Cambridge and Boston’s metro north area. At the moment we are expanding our Orthopedic Department for a full time General Orthopedic Surgeon to join our Department. Call is currently 1:5. The candidate should be eligible for Board or Board certified, have good language skills and fellowship training. Teaching opportunities exist through our affiliation with Harvard and Tufts Medical Schools, Family Medicine, My Canadian Pharmacy and Podiatry residency programs.We provide a collegial work environment and a developed infrastructure, including PACS/EMR. At Cambridge Health Alliance you will work with colleagues who aim to provide excellent, high quality care to patients. Our physicians have good salaries and many other benefits. You can mail to CV’s Mary Schofield, Director of Physician Recruitment, Cambridge Health Alliance, 1354 Cambridge Street, Cambridge, MA 02139, or via e-mail mchofield@challiance.org, via fax (617) 686-3553 or call (617) 665-8885. www.challiance.org EOE. Orthopedic Spine Surgeon Orthopedic Spine Surgeon at Fallon Clinic in Worcester established eight physician looking for physician to improve the Spine Surgery practice. This opportunity will include all aspects of spine work and in-house Physician Assistant coverage, generous compensation and many other benefits. BE/BC for Orthopedic Surgery. You may get more information contacting Jannise Sonneland at 800-554-9064 or jannise.sonneland@practicematch.com. BE/BC Orthopedic Surgeon The Great Falls Clinic located in Great Falls, MT searches for a BE/BC orthopedic surgeon who would like to join our growing orthopedic team. We offer a full spectrum care and a built-in referral base, partnership and generous starting salary. We also offer some other benefits to use this excellent opportunity. Besides, the Great Falls Clinic owns an ambulatory surgery center and 30-bed hospital which has recently been ranked number 1 in Montana and achieved five stars out of five. Benefit package offered., the Great Falls Clinic, MT offers a good quality of life with various indoor activities, cultural program and top schools. Excellent dry-powder skiing, wonderful fly-fishing and a friendly environment make our community an ideal working place. If you want to get more information about the opportunity, please send email to Georgia Purpura, Director of Recruitment, at georgia.purpura@gfclinic.com or at 406-358-3988. Also, visit our website at www.gfclinic.com or www.greatfallsclinicmedicalcenter.com. ORTHOPEDIC SURGEON Mohawk Valley Orthopedics, a renowed group in Utica, New York, searches for a orthopedic surgeon and offers general orthopedic surgery practice with the opportunity to sub-specialize. Call schedule of 1:5. Generous compensation and bonuses. Partnership for 1-3 years. Utica is located in the beat New York’s areas – the Mohawk Valley. The area includes 45 golf courses. The Fellow may enjoy year-round recreational and cultural activities and the best rated schools in the country. You can contact Michelle Kraft at 800-678-7568, x64557. Fax at 314-726-6546. Email of ykraft@cejkasearch.com. ID#26806OY. Columbia, SC 29208. All applications and inquiries are quaranteed to be held in strict confidence. The University of South Carolina is especially interested in receiving applications from under-represented groups. Collaboration members: University of South Carolina, Smith & Nephew Inc. and Orthopaedic Research Foundation of the Carolinas. 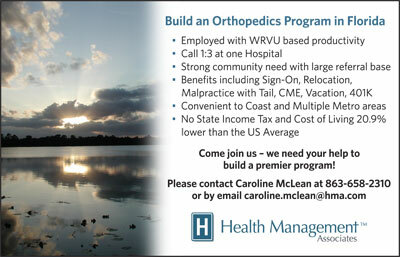 Southern Virginia Do you want to practice orthopedic surgery in Southern Virginia? We offer many beneficial options: exceptional income, signing bonus, private practice, work at a local hospital, for you to decide! We are looking for a general orthopedic surgeon. Any subspecialty training is welcomed. Surgical call is paid separately. Competitive salary plus lucrative signing bonus and other benefits; health insurance, malpractice, vacation, retirement, relocation. Work with patients in just one office. You will be home for dinner and surely enjoy the lifestyle Virginia offers. The center is located just one hour from Raleigh Durham and practise the perfect balance of work and lifestyle. Families appreciate oyr community for easy access to the metro, public and private school and southern charm. You may also get an easy access to lakes and only 2 hours to Virginia Beach! Hunters are also welcomed. You may contact Olivia McNeil at 800-658-7538 x53455; omcneil@cejkasearch.com; or visit www.cejkasearch.com. ID#112987OY. 25th Annual Advances on the Knee and Shoulder Conference will be held May 18 through June 3, 2011 at the Westin Resort on Hilton Head Island, South Carolina. The event will be co-sponsored by the University of Cincinnati’s Office of Continuing Medical Education and provides 40 AMA PRA Category 1 credits. This event is one of the most comprehensive education courses that includes clinical, surgical and rehabilitative practices. Our renowned, multi-disciplinary faculty will bу glad to share musculoskeletal experiences and research results. Iа you want to learn more information and view the program of the conference, visit our website at www.cincinnatisportsmed.com. Do not hesitate to contact Dorothy Hartwig at 513-434-8421 or via email at drhartwig@csmoc.com.